The Asha 306 features a redone Series 40 phonebook. Under the new Asha Touch interface it integrates with the Call log and the Dialer, which is a common arrangement among smartphones. Contacts are displayed with a photo and number and, on top of the actual list, you get the Advanced menu and Add new contact shortcut. Then comes the search field. The actual contact details are displayed on a completely redesigned screen compared to previous S40 phonebooks. You get a faded contact's picture as a background, with a huge name across and a number below. A few big thumbable icons at the bottom of the screen let you call, text or email the person. You can add various details to your contacts, like numbers, email address, ringtone or a URL. You can also choose where to save your contacts - the SIM card or the phone memory. Only two sorting options are available - by first or last name. Contacts can be copied, moved or deleted either individually or in bulk. For the most part, the telephony options on the Asha 306 are pretty straightforward. The in-call sound is loud and clear. As we already said, the Contacts, the Call Log and the dialer are integrated like in mature smart platforms. What's missing is smart dialing. 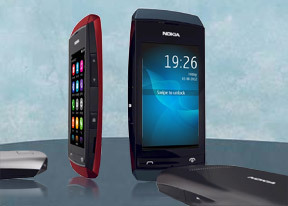 We had no reception problems with the Nokia Asha 306. We tested its loudspeaker and found it loud enough, as loud as the one on the Asha 311, but not as loud as the 305. A tap and hold on a Conversation in the default view of the messaging app lets you delete the conversation or call/email the contact in question instead. Creating a message is pretty straightforward. You can add multiple contacts from your phonebook or simply punch in numbers. For text entry, you can choose between a portrait multitap keypad, portrait QWERTY keyboard and a landscape QWERTY keyboard. You get a character and message counter either way. Unfortunately, there's no text selection or copying. The portrait multitap keyboard is accurate and can be fairly fast if you enable text prediction. The portrait QWERTY is quite cramped on the 3" screen and the resistive screen requires a bit more pressure than we're used to after using capacitive screens for so long. It's possible to type on in, but in general our thumbs didn't have the accuracy needed to do it error-free. Flipping the phone horizontally gives the keyboard a lot more room to work with and accuracy is not an issue. We still wish we had a sensitive capacitive touchscreen to work with, the experience on the Asha 311 was better. The email client supports various services such as Google, Yahoo, Hotmail, etc. with easy email setup, but you can always manually configure an account too. It works with POP3, SMTP, and IMAP4 protocols and supports SSL. When we set up our Gmail account, the app asked us if we want to sign in Gtalk too, which was a pleasant surprise. You can switch between accounts from the fourth tab at the bottom of the screen. The default email view is Inbox but Folder view is supported too, though there's no combined inbox. Multiple emails can be moved or deleted using the advanced menu in the top left corner. A tap and hold on an email will allow you to reply, delete, star, forward or mark it as read/unread. Emails are received in the background and a small * appears on the Mail icon in the app launcher when a new email has arrived. The chat client supports multiple services - Facebook, MSN Messenger, Google Talk, Yahoo and Nokia Chat. The tabbed UI of the OS is pleasantly thumb-friendly and those services can run in the background (a circle in the status bar shows your status when you're online, e.g. green for "available", red for "busy").